WEST JORDAN, UT--(Marketwired - Nov 20, 2014) - Just in time for the holidays, Mountain America Credit Union is excited to announce the release of a new online and mobile feature, Skip-a-Pay, which provides members the benefit of skipping a month of payment on qualified loans. Using this feature, members have the option to skip up to two months' worth of payments each year on most auto loans, personal loans or credit cards. This can be especially advantageous during the holiday season when finances may tighten for many families as their budgets are stretched. "It is our goal to help our members have more control of their finances," said Nathan Anderson, chief operating officer of Mountain America Credit Union. "We accomplish this by providing tools and resources within our online and mobile platforms. If being able to skip a payment can help our member, we empower them to take advantage of this benefit using the convenience provided by our online branch and mobile app." Upon log-in to the online branch or mobile iOS and Android apps, members can see at a glance if their credit card or loan payment is eligible. They can then select the option of skipping their next payment for a processing fee of only $25. During the life of a loan, up to four payments can be skipped. Mountain America Credit Union has more than $4 billion in assets and serves more than 492,000 members, wherever they are, through online and mobile banking, 70 plus branches in five states, and provides access to more than 30,000 ATMs and 5,000 shared-branching locations nationwide. 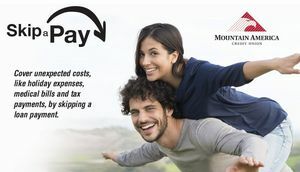 With roots dating back to the 1930s, Mountain America offers a variety of financial products and services for consumers and businesses, including savings accounts, auto loans, checking accounts, mortgage loans, business checking, student loans, SBA loans and retirement options. Visit www.macu.com for more information.